SIME Darby Property (SDP) is introducing its third instalment of the Parade of Homes campaign from March 6 to June 15 that offers homebuyers better financing solutions that will allow them to continue buying property despite the current economic sentiment. SDP is teaming up with partners Maybank, CIMB and HSBC to offer, among others, a special easy payment scheme that allows buyers to pay the difference between the purchase price and the loan amount in monthly instalments of up to 12 months. Buyers will enjoy an interest-free period during construction and an exclusive rate of BLR minus 2.3 per cent after vacant possession, SDP said in a statement. There is also an early bird cash rebate of as much as RM10,000 for purchasers who sign their sale and purchase Agreement (SPA) during the campaign period. Buyers will enjoy "zero entry" cost which entitles them to free stamp duty on memorandum of transfer, legal fees and disbursement on SPA and stamp duty on loan documentation. On top of these incentives, SDP will also offer its Guaranteed Buy-Back programme, which provides property buyers peace of mind by allowing them to sell their property back to the company. The first Parade of Homes in June 2008 attracted over 15,000 visitors and generated sales worth more than RM246 million over nine days, while the second one in November 2008 generated over RM146 million in sales. SENAI Airport Terminal Services Sdn Bhd (SATS) will be launching the multi-billion ringgit Senai Aviation & Airport City mixed development project in the second quarter of the year. Sited on 1,133.11ha beside the Senai International Airport, the project would be undertaken by SATS’ wholly-owned subsidiary Enigma Harmoni Sdn Bhd and comprise three main components, said deputy chief executive officer Shahrull Allam Abdul Halim. Residential, commercial and hospitality amenities will be featured in the first component spanning 323.74ha while an air cargo logistics centre and high-tech park will occupy 404.68ha each. The entire development would take about 10 years to complete. Enigma Harmoni has received planning approval from the Kulai Municipal Council for the project which also includes a Customs Inspection Quarantine Complex (CIQ). “We will launch the high-tech park first as this is a vital component of the entire development,’’ Shahrull said in an interview with StarBiz. It will be the second high-tech park in the country after Kulim Hi-Tech Park in Kedah. He said the investment in infrastructure was estimated at about RM1.2bil. Other facilities will include private medical centres, international schools, premium hotels and duty-free shopping centres. The high-tech park aims to attract investments in the avionics/aeronautics industry, information and communications technology industry including integrated circuit design, high-tech manufacturing, bio-medical and bio-technology, solar industry, food and agri-technology and environment including renewable energy. He said among the companies and investors targeted were those in the pharmaceutical industry from Austria, Germany and Switzerland; oil and gas, and solar energy sectors in the United States; and Japan’s motor vehicle sector. “It is a pre-requisite for companies operating in our park to have research and development (R&D) elements,’’ added Shahrull. He said there would be a flagship building known as the knowledge centre where most of the R&D activities would be undertaken. The building will incorporate collapsible office and laboratory incubator concepts where higher learning institutions could bring their undergraduates to undertake R&D studies or programmes with the companies or the industries. Shahrull said it would collaborate with Universiti Teknologi Malaysia main campus in Skudai, Johor to participate in the university-industry R&D programmes. He said SATS was looking at participation from China companies in the development and construction of Senai Aviation & Airport City. Shahrull said it would collaborate with established high-tech park operators in China’s Pearl River Delta region to market the Senai park. “Ours will probably be the first integrated high-tech park in the world connected to the airport. Similar parks like the ones in Frankfurt and Dubai are located several kilometres from the airport,’’ he said. Opened in 1974, Senai Airport is managed by SATS which took over the operations of the airport from Malaysia Airport Holdings Bhd in 2003. AERO Mall, the first stand-alone and external airport mall in Malaysia currently under construction at Senai Airport, is scheduled to open by year-end. The RM70mil mall offers 3,716.12 sq m of retail space. 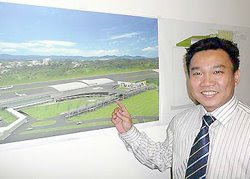 Chan Kwai Yew with an artist's impression of the Aero Mall. Senai Airport Terminal Services Sdn Bhd general manager finance and retail development Chan Kwai Yew said the mall would be positioned and marketed as the new lifestyle hub in the area. “Shopping, dining and entertaining at airports is getting popular as airports are no longer just places for air travellers or well-wishers to send off airborne passengers,’’ he said in an interview. Chan said Singapore’s Changi Airport Terminal 3 was the best example of this as it had successfully attracted non-air travellers and residents from nearby areas to shop and dine there. SATS is targeting the business community, executives and senior managers working in the nearby industrial estates and the 192,000 population (2005 figure) in the Senai-Kulai area. Chan said Aero Mall would also complement the Senai Aviation & Airport City to be launched in the second quarter of the year. Meanwhile, Plaza Premium Management Ltd has chosen Senai airport for its third Plaza Premium Lounge in the country after KL International Airport and the Low-Cost Carrier Terminal. Plaza Premium Lounge is the world’s first commercial VIP lounge open to airport users irrespective of airlines, travel class, air miles or membership programme. “We have invested RM500,000 for the Senai lounge and see good prospects as Senai-Kulai is located within the Iskandar Malaysia growth corridor,’’ said chief financial officer Clarence Chiu.